New Mars Vegas was built. 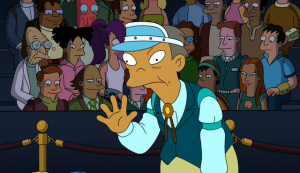 New member Leela and the other Feministas cause chaos with their protests and sabotages, including the accidental murder of the then vice-president Agnew. 3009 Universal Poker Championship was held in New Mars Vegas. Bender wins with 5 kings. Earth v. Feministas case was held resulting in the Feministas being sentenced to fifty years in prison. Bender helps the Feministas escape from Maxi-Padlock. Implosion of the Violet Dwarf Star was stopped by the Feministas. The Violet Dwarf Star is revealed to be an Encyclopod egg. The newly hatched Encyclopod defeats the last known Dark One. 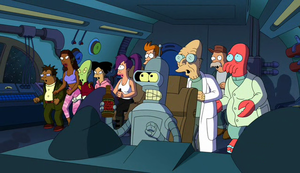 The Planet Express crew, Fry, Leela, Bender, Scruffy, Professor Farnsworth, Hermes, LaBarbara Conrad, Amy, Kif, Zoidberg (and possibly Nibbler), go through a wormhole. This page was last edited on 11 April 2011, at 21:40.